We live in an area where the number one goal people have for their dogs is to have them off leash when hiking or in official off leash open spaces. Having a trained and reliable off leash dog is uber different than taking your untrained dog off leash and letting them run around. When you take your dogs leash off you are making a powerful public statement that your dog is under 100% voice control, under all circumstances and distractions. This is advanced training. Puppies and adolescent dogs should be on a leash while training. Youth is youth, and they will make some pretty youthful choices. First and foremost, if a sign says ‘dogs must be leashed’ than please use a leash. This advice is for areas that dogs can be off leash legally. Know your dog and hope that your dog knows you. If your dog likes you and trusts you than being in your space off leash is reasonable. If your dog doesn’t trust you than you need to spend time working on your relationship before you even attempt off leash work. Keep your dogs call name valuable. While working in a contained area, every time you call your dog, reward heavily. Repeat this often and vary your rewards (whether it is a game of tug, fetch or food rewards). As far as value, your call name rewards should be crazy high value, don’t mess around with so so rewards, pull out the meatballs, left over chicken, beef, your dogs wacko favorite fetch toy. Coming to you should mean the BEST possible thing in the world. You build power in their call name by doing this, it’s association and it’s powerful. If there name means that meatballs fall from the sky, well then, WOOP! Add distractions slowly. If you have a reliable recall in your yard, put a long line on your dog and go into a field and practice, then try a trail with low activity. Slowly build up to more distractions. note – Don’t let your dog fail. If you have your dog off leash in an open/free area before they are ready, and they fail and run away, you are encouraging them to pattern an unsuccessful and potentially dangerous behavior. Stay in a contained area for as long as you and your dog need. When you move from a contained area to a trail, open space or park, have your dog on a long line, it’s insurance, and it’s cheap. When you are ready to try off leash, ALWAYS carry a leash or long line in your hand. When you are ready to be off leash on a trail or open space, keep your dog with you. This isn’t the time to think about your check book, dinner, or pending engagement. And it for sure is not the time to take your phone out and start texting. When you are ready to be off leash, your dog needs your undivided attention. You are working your dog with your verbal leash, your voice. Engage, stay interactive, reward for being in your space. If there are distractions that are over your dogs skill level, please put the leash on. Stay successful. If you are out and about with multiple dogs off leash, know all of their skill levels and use their leashes fluidly when distractions change. 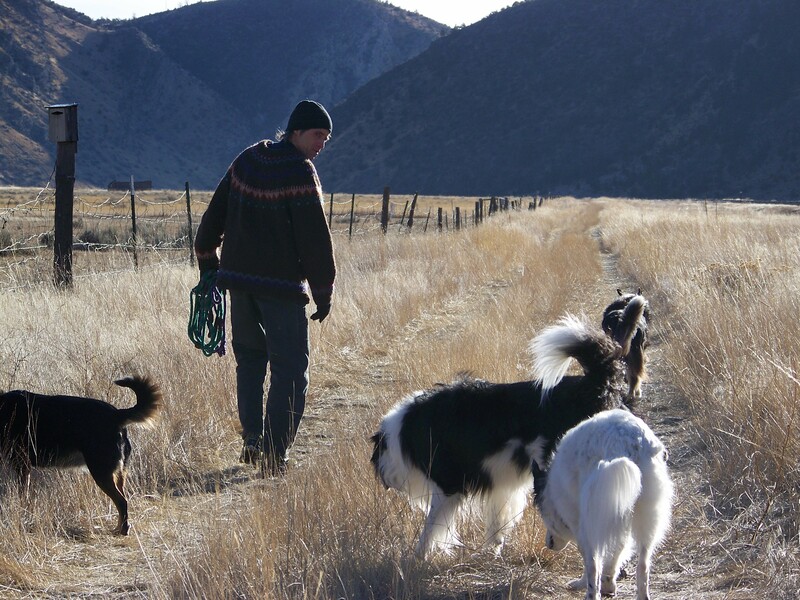 Off leash with multiple dogs is more management and work for the handler. Advanced training takes; time, consistency, and maturity. Don’t be in a hurry to take your dog off leash if you haven’t put the time in. Keep your dog successful, they’re your responsibility. These are good tips. I always have my dogs on leash even when off-leash is permitted—becaues I’ve never (and I mean never!) seen a well-trained dog on any of my walks. Most of them are lunging at the end of their leashes, madly barking and totally oblivious to the owner. The rest of them are more or less the same thing but not on leash. As long as my dogs have a harness and leash, I can lift them to safety. I think it’s frustrating that you can’t go for a walk safely. Sometimes I wonder if the people who don’t care enough or know enough, aren’t the ones who have more access to more areas. It should be the owners who care enough and are trying to the do the right thing. You lucky you can pick your dogs up… it would be a major trick to pick up all four of my border collies! I can’t even walk my dog safely around the street to start training him (he’s too fearful right now to even listen) and to practice because all the neighbors just open their doors and let their dogs roam. I never know when one might vault around the corner and send poor old Marty into an hysterial mess. you know, that is a problem in Bozeman too. In our classes we always talk about ‘just because it’s your neighborhood, or just because the trail is by your home, it doesn’t make it the right place for you and your dog’. I love driving to new areas and walking my dogs in areas where we can both breathe. If your neighbors don’t care enough, find a place that is safe and stress free to start with… Here is to zero conflict walks for you and Marty! I love these recommendations! Since I have a husky mix, being off leash really makes me nervous. They are known to just take off running and never look back! Luckily, mine is highly trainable and super food motivated. We have a long, thin line we work with because 1) I don’t have a backyard and 2) he’s too smart and knows when he is on leash and off leash so we are trying to fade out the feeling of the leash as we work on distance and distractions.. 🙂 Thanks for the extra tips!! Thank You, for the excellent article. I guess I did not realize just how blessed I am to have my blue heeler, the first dog I’ve raised fro a pup. We live next to 1200 acres of state land, very few hikers. I give him tons of exercise/play/fetch, and he is so devoted and obedient, he always responds when I call him. I know nothing about training, just love and consistency; must be the breed? Anyway, I guess we’ve got a chunk of doggie heaven here! I’m not sure who these people are but I have never had a problem in Bozeman with off leash dogs. If your dog is on a leash I will put mine on a leash, if not they will meet and greet and move on. Coming from Phoenix Bozeman is a great dog town with some of the best dogs I have ever met. If I do see a dog that looks like trouble we just ignore him and pick up the pace a little. A dog that never gets to run free is like a cat that never gets to go outside. They get a little crazy. My dog was lucky and got to go Nancy’s classes as a puppy and also went through her canine good citizen class. That was time and money well spent for both of us. Have a great summer enjoy your dogs. Colby, it is so great to hear from you. I wish everyone was as respectful while out and about as you are with Hunter. Hope you are all doing well! send us a new photo, the last one I have is Hunter in teh golden light of sunset I think, gorgeous, but I’m sure he has matured since then. I agree!! I hike a ton with my yellow lab off leash and never have run into any problems with dogs off leash (but mostly I think that is because my dog is too obsessed with finding the perfect stick to be bothered with any other dog). But I also attribute my well-behaved dog to spending the 1st year of her life being fairly strict and going to a lot of Nancy’s classes. My top recommendation for anyone who gets a puppy is to spend the 1st year of the dog’s life with a lot of training and being strict at home (meaning no feeding from the table, telling them to go to bed and not beg, don’t allow on furniture, don’t allow access to the whole house when they are home alone, etc..) After the first year- my dog knew wrong from right and has access to whole house and is allowed to snuggle with me on the couch and bed (and sometimes I have to bribe with a treat to get up on the furniture). I wish more places would recognize canine good citizens and that dogs that get certified should be able to have more privileges like access in stores or being allowed off-leash in some leash only places, or even being able to stay in hotels… If there were more rewards to getting your dog certified (besides having a good dog), I think more people would do it. Thanks Nancy for always sharing good advice! Great advice. Just one clarification question….you mention “call name” a bunch…is that different than a dog’s name and “come”….that’s what we use. Are you suggesting developing an alternative call? your ‘call word’ should be the word that you use to call your dog to you that has the definition of ‘come to me!!!’. If you use a word or word phrase for ‘come’ and also other things, it can get a bit confusing for a young dog for sure. The main rule is whatever word you use for COME TO ME should never be a word or phrase that is ever used in a correction, or less than awesome tone.